If you’ve been to the Ithaca Farmers Market (and if you haven’t, shame on you), you’ve surely seen the hoards of people lined up outside of stand number 50, eagerly awaiting a delicious meal. Khmer-Angkor Cambodian Food attracts countless students, visitors, and locals each week, all of whom deem the food worthy of a half-hour wait or more. Even on a cold, cloudy day in April, the line at Khmer-Angkor extends past the neighboring stands and out the market pavilion. Given the stand’s popularity, kitsch decided to go behind the counter and investigate its allure. At almost 3 p.m., the Farme’s Market was closing for the day. Vendors at other stands were packing up or had already left, but there was still a line at Khmer-Angkor. When it finally died down, I was able to speak with the people working at the stall and hear their story. I quickly realized the passion they have for what they do, and was able to learn quite a bit about what keeps them, and their customers, coming back weekend after weekend. Marin Sen and her husband Bong have been running Khmer-Angkor at the Farmers Market for almost 13 years. The name is a combination of the Cambodian language Khmer and the Angkor Wat temple. Marin and Bong’s son, Soche, explained that his parents opened up the food booth as a side job—it was a fun way to spread Cambodian culture, while providing a little extra income. Over the years, Marin and Bong Sen have established a strong customer base and have made a big impact on the Ithaca community. As a local, I remember making trips to the Farmers Market with my parents when I was younger, and lunch at the Cambodian stand was always a highlight. 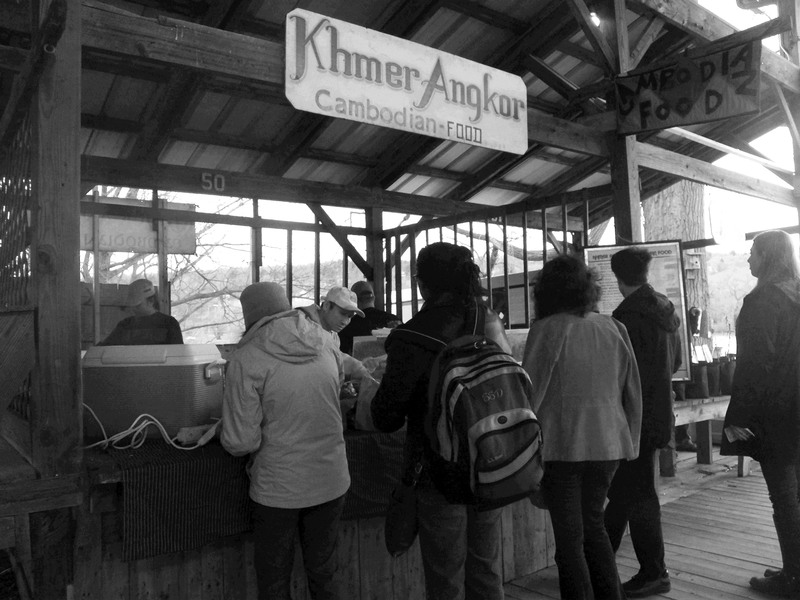 But Khmer-Angkor’s reach extends beyond the townie population—almost any Cornell student will tell you that upon arriving in Ithaca freshman year, the first thing he or she was told to try at the Farmers Market was one of Khmer-Angkor’s delicious dishes. In addition to the locals and the student population, Khmer-Angkor attracts many out-of-town visitors. “People travel from all over the place,” Soche explained. He said one couple from Albany used to come every weekend, and that they get a lot of visitors from Auburn, NY. While the menu may grow and change, the quality is always there. Despite serving more and more customers each year, “we try to keep that same consistency,” Soche expressed. “People appreciate it,” he added. “That’s not something that happens very often.” 12 years of consistent quality is indeed quite an accomplishment, one that hasn’t gone unrecognized—in 2011, Khmer-Angkor was voted the Best Booth at the Farmers Market by the Ithaca Times. Adding to these challenges, the family makes everything from scratch and cooks most of the food on-site. This effort comes through in the taste, but ensuring this type of quality and consistency takes a lot of work. In response to a question regarding the most challenging thing about what they do, Soche immediately responded that it was waking up so early. “We’re up at five o’clock in the morning because setting up the van is tough,” he said. Each weekend, they show up with all of their ingredients, cooking supplies, and other utensils, ready for the slew of hungry customers. While Soche likes getting to know the customers and learning about their experiences, he and his family have an amazing story of their own. Bong and Marin arrived in the U.S. in the early eighties, after leaving Cambodia during the Khmer Rouge and Pol Pot era. “When they were escaping, they were jumping from country to country,” Soche explained. “They had one of my brothers in Malaysia, another in Thailand, and finally me [four years after they got here] in 1986.” After several years as refugees, the Sen family was accepted to the U.S. and sponsored by the Immaculate Conception Church in downtown Ithaca. Even though running the food stand every weekend can get hectic, it’s one of the ways Soche maintains ties to his Cambodian heritage. As a first generation American, Soche enjoys the opportunity to spread Cambodian culture through cooking. “Growing up I didn’t really learn the language too much, so this is the way I kind of pass on the culture,” he explained. He hopes this will preserve his Cambodian roots for the next generation: “if the language is lost, at least the food is still there.” I think it’s safe to say that everyone who has experienced Khmer-Angkor’s food is thankful for Soche’s and his parents’ eagerness to share their culture. While I didn’t get the opportunity to speak with Bong Sen for very long or to meet Marin, I did leave with a strong admiration for this woman and her family, and the name they have made for themselves here in Ithaca. After only a 20-minute conversation with Soche, I understood the passion they have for what they do. The food at Khmer-Angkor speaks for itself; it is absolutely delicious. No one can deny that, not even the vegans, vegetarians, and lactose intolerant—all of the items on the menu are dairy-free. But there is a lot of good food at the Farmers Market. What makes the Khmer-Angkor Cambodian stand different is the people behind the counter.